"Do I need to register with the CFTC or the SEC in order to sell my trading advice? Do I need some kind of license to start a trading system?" If you are an American citizen, the short answer is: No, you do not need to register with any government agency, or pass any kind of test, or have a license in order to publish trading advice. However, you must be aware of certain restrictions. The most important restriction is this. You cannot provide individualized advice to clients. That is, you cannot offer different advice to different clients based on their individual financial situations. Allowed: "Attention all subscribers to my trading system: Buy IBM because I believe it is going up!" Not allowed: "Dear John Doe: based on our conversation earlier today, in which you told me you were nearing retirement, I think you should buy IBM, because it will appreciate in value!" You must simply restrict your activity to publishing non-personalized advice which your clients can choose to act upon or not. (Note that using Collective2 to disseminate your trading advice via a Web site and email is considered publishing.) Remember that our right to publish and say what we like is protected by the First Amendment, a right that our citizens fight for, to this day. No small matter, that. If you are not an American citizen, then I have no idea what kind of constraints your government places upon you. Please check with a local attorney. "Does C2 support non-USA stock markets?" Keep in mind, system developers, that your C2 model account is denominated in U.S. dollars, so all profits and losses that you make in your C2 hypothetical account will be converted back into U.S. dollars at the conversion rate in effect at the time your transaction is closed. Finally, we want to set your expectations. The support of these non-USA stock exchanges is new, and is in something resembling "beta test." It's all part of our effort to support the Obama Administration's global outreach efforts -- "open palm rather than clenched fist," and all that. So please report problems to us if you notice them. "I am a system developer. Which futures contracts can I trade? What are the symbols?" Collective2 supports most American and European futures exchanges. You can learn about our supported symbols and exchanges on our futures symbols page. "Can I trade options on futures?" Collective2 supports trading of options on equities and ETFs, but not options on futures. If your trading strategy involves trading of options on a major index, such as the S&P500, or the Dow Jones Industrials, consider using options on the relevant ETF instead. For example, if your system needs to trade options on the S&P500, why not use options on the SPY (the "Spider," an ETF traded on AMEX). Dow Jones Industrial Average? Use DIA (the "Diamond" ETF). "What brokers are supported by your AutoTrade technology?" We support a growing list of brokers, and many new ones will be added soon. Remember that the broker you choose will depend on what kind of system you want to trade. To trade a forex system, you'll need a broker that allows forex trading, for example. We also have more information about how AutoTrade works. Or you can watch a video showing an example of how to set up AutoTrading. "How much forex leverage do you allow?" When you run a trading system on Collective2, you are allowed to open positions based on the nominal amount of capital you have in your C2 Model Account. Each financial instrument requires you to put up a different amount of collateral. To put this another way, each instrument can be traded with a different amount of leverage. "Only 33:1 leverage for forex? That's crazy! My broker allows me to trade with 100:1 leverage!" Whoa, calm down there, cowboy. We restrict the amount of leverage you are allowed in your C2 Model account so that trading-system subscribers can more easily perform an apples-to-apples comparison of trading systems across various asset classes. Yes, it's true that traditionally retail forex brokers allow access to 100:1 (or even 200:1 leverage). In summary: do not fret about the 33:1 leverage restriction. This restriction allows buyers of trading systems to reasonably compare forex systems and futures systems (and stock systems). No one is stopping you or your customers from trading with higher leverage in their own accounts, if you or they believe it is a wise idea. "What about margin for stocks and futures?" The software recognizes spreads and straddles and condors, and will take into account the lower margin requirements available for certain less risky positions. For futures, we use industry-standard SPAN margins. "What if I don't want to use margin in my stock-trading system?" While the ability to use margin is always available in your C2 Model Account, you can choose not to use margin. This means you should buy half of what you are allowed to buy. For example, if you start your trading system with $10,000 of cash, C2 will allow you to buy $20,000 in stock (you'll see that you have $20,000 "Buy Power"). If you want to remain virginal, white and pure as snow, and refuse to use margin, then only buy $10,000 of stock (for example). "Do you use real-time quotes? Why can't I see real-time prices when I enter a trading signal for my system?" Yes, Collective2 uses real-time quotes to calculate trading system results, but we are not allowed to redistribute the quotes. That is why we do not display them. "Can I link to my trading system on my own Web site, or in an email?" Please click on the above links for more information. "How do I include my system equity chart on my own Web site, or in an email?" (of course, the number at the end is your system ID number; other people would use their own system ID numbers). Probably the first example is what you are looking for. "Can I write a computer program to enter my trading signals, instead of logging in and entering them manually?" Yes. Collective2 offers an automation interface so that programmers can write software which enters trade signals automatically. The technical documentation is available here. "Can I send my signals to C2 by email?" We encourage you to use the C2 Web site to enter your trading signals here on C2. Alternately, we recommend you use our Signal Entry API. But if you really, truly, absolutely prefer to email your signals to us, you can use our Email Signal Entry. Here's how it works. "Can I use TradeStation to generate my system's trades automatically?" Yes. We have a TradeStation Interface, which allows your TradeStation software to automatically post its trades on Collective2, without human involvement. Nifty! The technical documentation is available here. "Can I use NinjaTrader to generate my system's trades automatically?" Yes. Please see this page. "Can I use MetaTrader to generate my system's trades automatically?" "I currently use Interactive Brokers as my broker and type my trades into that company's TWS application. Is there any way I can automatically have my trades copied from TWS into my C2 system?" Funny you should ask such as specific question for which we have a positive answer. Yes! Please see this page. "Can I create a 'test' system in order to experiment with Collective2?" Yes, you can create a "test system" that is not publicly visible and does not affect your track record in any way. There are some very important restrictions you should be aware of. The most important is that you must declare your system as a test system before your enter any trade signals. Once you enter a trade signal, the system cannot be declared as a test system... ever. Otherwise, this would destroy the integrity of the C2 site, as it would allow vendors to hide their unsuccessful systems from the public. To designate a system as a test system, click the ADMIN button above your system chart and select EDIT SYSTEM DETAILS. Then scroll down to the area that describes test systems. Please be aware that You must pay the C2 listing fee before designating a system as a test system. About test systems: A test system does not appear to the public. No one can view its trades, and no one except you can subscribe to it or AutoTrade it. One nice aspect of a test system is that you will be allowed to completely erase your test system as often as you like, restoring it to an initial blank state. You can convert a test system into a live system, but you must entirely erase your track record before you do. Otherwise, the integrity of the C2 site would be compromised, for a similar reason as described above: vendors would convert only successful systems into live ones, leaving the unsuccessful ones invisible. "My system has too much capital. I want to scale it down so that it trades smaller quantities." To rescale, go to your system page, pull down the Admin menu, and choose "Rescale System," as in the picture below. To attract the greatest number of subscribers possible (and to make AutoTrading simple and easier to control for these subscribers) your system should have the smallest amount of capital as is feasible for your trading method (leave room for the inevitable drawdown, of course). When you have a lot of "extra," unused capital in your system, you make it more difficult to AutoTrade your system and scare away subscribers. "How can I attract more subscribers to my trading system?" Collective2 has spent hundreds of thousands of dollars to attract traders to this site. This large marketing effort helps you garner subscribers for you and your system. But if you are serious about earning subscription fees from your trading system, you should treat your trading system like a business and consider marketing it. Feature your trading system. One possibility is to increase awareness of your system here on C2. You can appear in the "Featured System" box. Only systems which meet certain performance criteria are invited to appear here. Alternately, you might want to consider opportunities outside of C2. 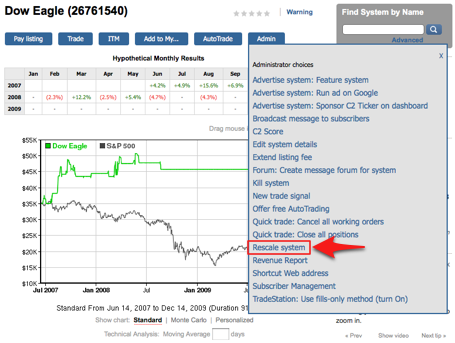 For example, you can advertise your system on Google, or on other trading sites. Be an active poster (but not a spammer) on non-C2 forums and message boards. C2 allows you to create a "shortcut" link that you can include in your posts and emails and advertisements. When someone clicks this link, they can be taken directly to your trading system on C2. Finally, keep in mind the most important thing you can do to increase your subscribers: Build a track record. Very few people will subscribe to a trading system that is brand new, has zero track record, and doesn't show profitable results. We therefore encourage you to consistently enter your trade signals here on Collective2, and have them verified and monitored by the site. 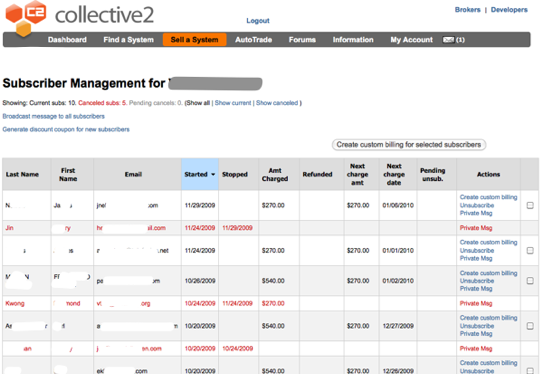 "I am a trading system developer and several people have subscribed to my system on Collective2. How and when do I get paid?" On the 20th of every month, our computer software calculates the "remittance" that is due to each system developer. This is the amount we have charged your customers on your behalf, less C2's fees and any refunds we have issued. In order to decrease our financial risk of credit card refunds and "chargebacks," we will remit transactions only when they are 45 days or older. This means that your very first remittance might take as long as 75 days to arrive (if the stars are aligned in an unlucky fashion for you!). However, once you receive your first remittance, you will receive your next remittance 30 days later, and remittances will continue on this monthly cycle - every thirty days, on the 20th of the month. Payments are transmitted through PayPal to the email address associated with your C2 account. You do not need to set up a PayPal account before your first remittance payment. PayPal will inform you that you have a payment waiting, and will allow you to set up your account and collect your funds then. If you live in a country where PayPal refuses to send you payments, we can work out an alternative arrangement in which checks can be mailed to you, for an additional service fee. The checks will be drawn on a U.S. bank and payable in U.S. dollars. "Please explain limit orders and stop orders." Here is an explanation of limit orders and stop orders. "How will I know when people "subscribe" to my trading system?" In addition to tracking who your subscribers are, and when they are due to be billed, you'll also be able to do things like offering special subscription prices to certain subscribers, or creating electronic coupons that you can offer to people who are not yet currently a subscriber, but to whom you want to offer a discounted price in order to incent them to subscribe. "How do futures and options expiration work on Collective2?" Futures: If you trade futures, it is your responsibility to be aware of when futures contracts stop trading, and -- if you want to keep a position open -- you need to roll into the next contract. Collective2 emulates the behavior of several discount brokers: we will not call you on the telephone to warn you that a futures contract in your account is about to be "delivered." Instead, we will unceremoniously close out your position, at the market, approximately 48 hrs before the last trading day of the contract. Thus, we strongly encourage you to gracefully exit any positions in expiring contracts at least a week before the last trading day. Options: If you own a long option position, and the option expires in-the-money, Collective2 will automatically exercise your position on the Saturday morning after expiration. This means you will buy or sell the underlying stock. Thus it's important that you have the margin available in your account; otherwise, you'll be greeted on Monday morning with a simulated margin call. Similarly, if you are short an option, and the option expires in-the-money, Collective2 will automatically exercise your option. This too will mean that you will buy or sell the underlying at the strike price. If you don't want to be exercised/assigned, then be sure to close out your option position before the end of trading on expiration day. "If I subscribe to my own system, will I be really charged my own subscription fee?" C2 offers two ways for a system developer to "experience" his or her own system. You can outright "subscribe" to your own system -- just like a reguar subscriber. In this case, everything will be exactly the same as if you were a real subscriber. You will be charged your own subscription fee, will receive all billing-related emails, etc. This option allows system developers who want to see exactly what a customer experiences to have that customer experience. But you do not need to subscribe to a system in order to enjoy subscriber-like functionality. System developers automatically will receive signal and broadcast emails from their own system, and will be able to use Instant Trade Messenger (ITM) and will be able to AutoTrade their system -- all without overtly subscribing to it. It's up to you which option you want to use. "Does Collective2 realistically handle dividends?" Yes, we will automatically credit your C2 simulated account with cash dividends when you own a long stock position before ex-dividend date. Similarly, we will debit your account if you have shorted a stock. "Can I trade mutual funds on Collective2? What about Rydex funds?" Yes. Collective2 is intelligent enough to handle mutual funds and Rydex funds. We use PM pricing. To trade a fund, select that you want to trade a stock in the trade-entry screen. Then type the mutual fund symbol. "Does Collective2 support Market on Open (MOO) or Market on Close (MOC) orders?" "Can I create 'conditional' orders?" "There was a problem with a trade on Collective2. Collective2 made a mistake. What should I do?" "Can C2 send trading signals to my cell phone?" When you're on the Edit Account Info page, scroll down towards the bottom of the page. You'll see an area where you can choose to have your signal emailed to an "alternative" email address (that is, an address that is different than what you use to log in to Collective2). Type in your cellphone's email address (learn your cell phone's email address), then select that you want these alternative emails to be sent using SMS message format. Finally, you can choose to send signals both to your alternate mail address and to your regular address. If that's what you want, check the box labeled Also send to main email. If you do not check this, then signal emails will be sent only to your mobile phone. Don't forget to click Save Changes at the bottom of your page when you're done making these changes. "What Time Zone is used when trade times are posted on Collective2?" "I'm a trader looking for a great trading system. What do you recommend?" Please don't email us asking what trading system we recommend that you use. (To understand why, read this answer to the question from a system developer which explains what kind of trading recommendations are legal). However, we think that the C2 Web site provides a powerful set of tools that allows a reasonable person to make reasonable decisions about trading systems. Therefore, we suggest you take the time required to explore this site. Learn as much as you can about a system before jumping in. If, after some investigation, you conclude that C2 lacks a feature or tool that would help you make a better decision, let us know what feature you want to see. We'll try to add it to the C2 site. "Can I use C2's AutoTrading technology to place trades in my TradeStation brokerage account?" No. While you can use TradeStation to generate signals and add them to your C2 trading system, we can't help you place trades at TradeStation's brokerage arm. Unfortunately, TradeStation Securities does not allow third parties like Collective2 to automate trade entry into their brokerage platform. Since they are not accommodating, we suggest you investigate other brokers -- some of which not only offer automation capabilities, but also offer lower commissions too. "What do the abbreviations BTO, STO, STC, BTC mean?" STO: "Sell To Open" - Sell short in order to establish a new short position. (For stocks, abbreviation becomes SSHORT). BTC: "Buy To Close" - Buy in order to cover (close) an already-open short position. STC: "Sell To Close" - Sell in order to exit and already-open long position. "I subscribed to a trading system, and I got an email recommending various trades. Can you explain what the terms mean?" This means: "Enter at your broker a trade to Sell Short IBM @ STOP 22.75." (If you do not know the terms "stop order" and "limit order," see this.) Notice that, when appropriate, Collective2 also tells you what price it expects you to have received, if you entered the order at the exact instant that the system vendor did. (This is what likely fill means).